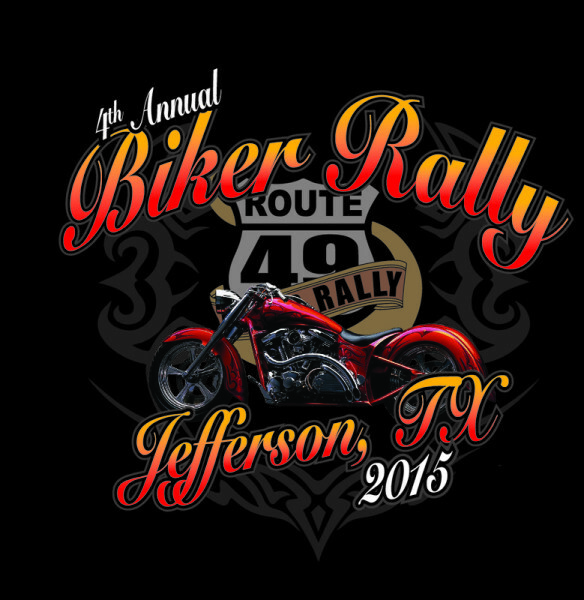 The past few years the Annual Route 49 Biker Rally is held in the spring in Jefferson TX. The rally is held as a fundraiser with the proceeds going to some very good causes. A day pass will be offered for $15; the weekend ticket is $25 and includes poker run, biker games, bike show, and tent and dry RV camping at the RV Park (no hookups). The “VIB” Very Important Biker Pass is available again for $100.00. This package will be well worth the money and will have benefits that others will envy. 10:00 AM – 4:00 PM: BLOOD DRIVE – Carter BloodCare – please roll up your sleeve and give! Noon – 6:00 PM: Kid’s Corral – supervised. Kids of all ages. Crafts and games. Location: at the red stage near the small red house, on river side of the RV Park. Say final good byes, pack up and head home. A good time will be had by all. For more information visit: www.route49rally.com, email: info@route49rally.com, or call 972-226-7205 or 903-742-2041.